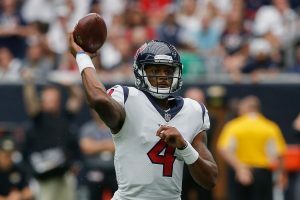 Five Questions For Week 8: Deshaun Watson To Be Grounded? Each week of fantasy football is defined by certain issues. Injuries and playing time are some of the most important things to team owners and five questions for week 8 will look at these things. Odds are most fantasy teams will be affected by at least one of the issues addressed here. If not, the methods of making decisions can still be applied to many situations. What Running Back Is Most Likely To Break Out In Week 8? There are multiple running backs that look like they are trending in the direction of fantasy starter. Joe Mixon of the Bengals has seen more opportunities since week 3, but not much has come of it. Colts rookie Marlon Mack has displayed elite explosiveness, but his touches have been severely limited. Dion Lewis has seen his carries increase each week over the last 4 contests for the Patriots. His production has increased with the workload, but has he plateaued? I think that the best bet for a big week is Mixon, but the Bengals have dashed my hopes before. He is facing a bad defense with a workload that seems fairly steady for the moment. Mack is getting more carries and I would start him at the flex. I do have some concern that the game script could take the Colts away from the run game. There is a solid chance that Dion Lewis tops 100 total yards. There is also a chance that Belichick suddenly features Rex Burkhead or James White; relying on a Patriots back is risky business. Is There A Safe Redskins Receiver To Start? The short answer here is, not really. The closest thing to a "safe" Redskins receiver is Chris Thompson and he is a running back. The wide receivers are deployed with seemingly no regard to common sense. Coach Gruden says that he will ride the "hot hand". Maybe that means the guy with friction burn from dropping passes? It cannot mean the best production because there has been little of that. If I were to choose a receiver to own it would be Josh Doctson, but it would be hard to start him. If you expand the possibilities to all pass catchers, Jordan Reed has the best track record. Still, he has one good game this season and a long injury history. Despite all of this, Kirk Cousins has managed to maintain a nice level of production. For now, keep the 'Skins wide receivers on the bench. Can the Seahawks D keep the explosive rookie quarterback under wraps? Should Deshaun Watson Be Started Vs. The Seahawks? It has been a rookie season for the ages for Deshaun Watson. He has thrown for 14 touchdown passes in the last four weeks and is a top five fantasy quarterback. He has also not faced an elite defense yet and still turned the ball over four times in those four games. The Seahawks have given up more than 20 points only one time this season. It was against a mobile quarterback in Marcus Mariota, but his stats were not huge in that game (225 yards 2 touchdowns). I think that Watson will likely put up around 15 points in this matchup. If you do not have a viable backup then go with the upside play in Watson. Just realize that this is probably not a 30 point week for the rookie. Who Is The Number One Out-Of-Nowhere Pick For Week 8? There is an innate likelihood that this type of pick will not pan out. If the odds were great that a player would have a big game, they would not be out of nowhere. My favorite guy to produce suddenly this week is Mike Williams of the Chargers. Injury kept Williams out for almost half the season and he has not gotten many chances. He should be starting to grasp the offense and the Chargers are facing a bad Patriots defense. Watch for Rivers taking a couple of shots downfield to the first round rookie. As rookies go, Hunt is in a class by himself. He faces his biggest challenge to date against the Broncos defense. What Top Player Has Bust Written All Over Him? 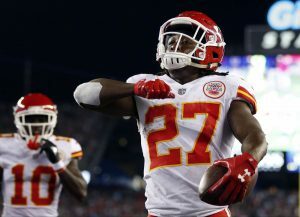 The early part of the season has been amazing for Kareem Hunt. Odds are he is going to stumble at some point and the Broncos are the logical stumbling block. A "bust"week for Hunt might still be 10 fantasy points based on his involvement in the passing game. He was held to 21 yards on the ground versus Pittsburgh and still scored 11 points in standard scoring leagues. Still, the Broncos have elite defensive personnel that will make it a tough week for Hunt and the Broncos. Of course, I would still have Hunt in my lineup. Just realize that this could be the only time this season that he is in single digits. If you missed it earlier in the week, check out this feature from Jake Trowbridge on finding the right fantasy "expert". 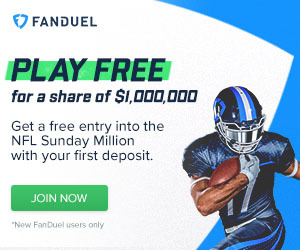 Check back each day for more exclusive content from Fantasy Knuckleheads. Be sure to check us out on Twitter for more insight and analysis: @_knuckleheads and @brendancole16. Category - Fantasy Football News and Analysis - Five Questions For Week 8: Deshaun Watson To Be Grounded?